I don't know, maybe I have scurvy or something because while I'll never turn down a dessert featuring chocolate, I've been more and more drawn to things lemon these days. It's weird! Could it really be a Vitamin C thing? Who knows? In any case, this simple Glazed Lemon and Poppyseed Loaf really brightens up a dull afternoon!! I'm calling this a "loaf" which sounds healthier and less decadent somehow, but really that's just semantics-- let me be truthful and just say that this is a cake through and through. A wonderful, simple, homey one at that, but a cake at heart, so don't go fooling yourself into thinking that it's not the calorie-laden thing that it is. That said, if you're looking for tender, moist lemony cake sprinkled with crunchy poppy seeds throughout, and a chewy crust that's been bathed in a lemony glaze, you're going to adore this. It's easy to make, keeps well and works just as nicely as a not-too-sweet after dinner dessert, as it does as with a cup of tea in the afternoon or as a breakfast treat. What is it about the combination of lemon and poppy seeds that is so appealing? Why not lime and poppy or grapefruit and poppy? Or hold onto your hats, apple and poppy?!! Yikes! In any case, with several more weeks of winter to get through, don't we all deserve a bright, citrusy, delightful reminder of spring?!! Make the cake, I mean, loaf and enjoy every lemon/poppy bite!! 1. Make sure the rack is in the center of the oven and preheat to 350ºF. Generously butter and flour a 9x5 loaf pan and set aside. 2. Sift the flour, baking powder and salt together into a medium bowl and set aside. 3. 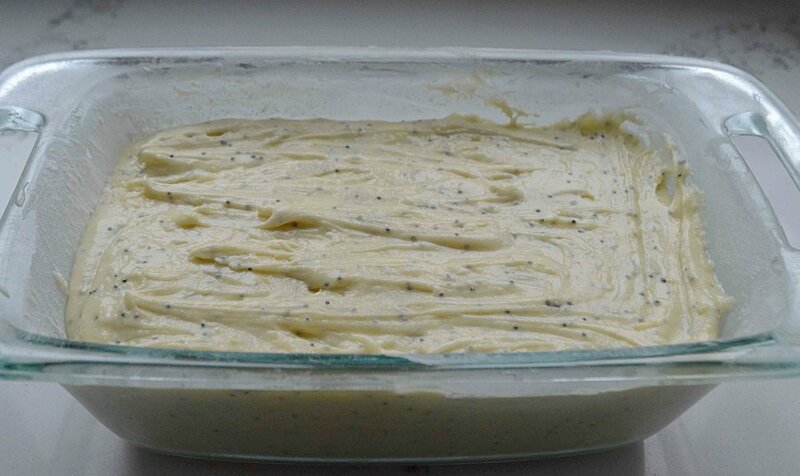 Place the melted and cooled butter, cream, lemon zest and juice and poppy seeds into a large bowl and whisk together. If the butter hardens into little lumps, heat the mixture just a bit until the batter is thick and smooth. Set aside. 4. If you have a stand mixer, attach the whip (if not a handheld mixer will work just fine too--just tack on about 5 more minutes to the beating time) and beat the eggs and granulated sugar together for about 5 minutes, until light, fluffy and lemon colored. Remove the bowl from the mixer. 5. Use a large rubber spatula to gently fold the flour mixture into the egg mixture until just combined. Then, fold about 1/4 of that mixture into the butter/cream mixture to lighten it. Fold in the rest of mixture only until combined. Pour the batter into the pan and smooth the top. 6. Bake for about 1 hour until the top of the cake is golden brown and springs back when you press it with your fingertip and a cake tester inserted into the center of the cake, comes out clean. Let cool in the pan on a wire rack for 30 minutes. 7. While the cake is cooling, you can make the glaze. In a small bowl, whisk the confectioners' sugar and enough of the lemon juice to make a smooth, pourable glaze. 8. Turn the cake out of the pan and place it right side up on the rack. Place a sheet of foil or another pan under the rack to catch the drips and pour the glaze all over the cake, letting it drip down the sides. Let the glaze set a bit and then serve or store at room temperature, well wrapped for several days. Note: Recipe adapted from Flour by Joanne Chang.